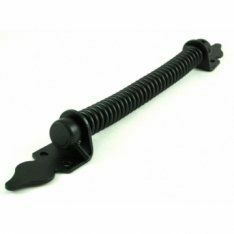 Sprung hinges and coil gate springs are typically used to aid any exterior hardware such as gates and doors are they are being opened or closed. Our models use a self-closing mechanism which can be adjusted both horizontally and vertically. We have ensured that every single one of our products has been manufactured with extremely strong polymer and stainless steel to help deter any possibility of corrosion or rust. We have one of the most comprehensive ranges of exterior hardware and security products on the market, which includes a multitude of high-quality tee hinges. Our designs are guaranteed to greatly optimise the smoothness of operation for any gates or doors. A wide selection of our products have been hand made from anvil, which means they have been heated and shaped on an individual basis to increase both durability and strength. Heavy reversible hinges are also in sure supply and come in a variety of high-quality and long-lasting finishes such as galvanised steel. At the top of our range is the black reversible hinge which comes specially made with a polyester powder coating to alleviate the possibility of rust. In order to sustain the weight from typically heavy hardware, you will need to install any of our hook and band hinge products. We have a diverse range of products which means hardware of all shapes and sizes have been catered for. If you’re looking for further advancements on the security being observed over your exterior hardware then we have gate hinges and fastenings. Amongst our range we have complete sets that come as standard with all the required screws, hooks and fixings to provide simple installation. A selection of gate latches are also on offer, including the highly inventive Magnalatch models. This particular design uses specially integrated self-closing mechanisms to help prevent the chances of jamming or sticking taking place. Many people prefer a conventional method of securing their exterior hardware, in which case you will need to put ring gate latches in place. We have three high-quality designs which come in either Shakespearean, ornamental or zinc plated finishes. If you find that certain gates and doors are being operated on a frequent basis, you will need to make sure they have been equipped with gate bolts. This is a simple yet effective concept that keeps structural integrity in place whilst making the process of opening and closing hardware far smoother. Adding character and style can be easily achieved with any of our coloured gate bolts which come in either red, blue, green or pink finishes. We also have hot bed handles in stock, which includes high-quality and galvanised designs that are either 150mm or 180mm in size. Garage doors must always be secure when you are entering and exiting. The most efficient way of keeping garage doors in an upright position is installing garage door stays. By using a strong cord, you will be able to push and pull open garage doors with ease. If you’re involved in equestrian and are looking for any equestrian ironmongery products, we have one the most complete selections in the industry. There is everything you could possibly need to enhance your experience with equestrian as we currently stock saddle racks, saddle poles and stable hangars. Hasps and stables are the perfect way to further increase the level of security achieved with any exterior hardware locking mechanism. The hasp section will act as a secure fastener which will then be covered by the stable component to secure any exposed pins and padlocks on gates or doors. In many cases, the most necessary method needed to secure any exterior hardware is the use of padlocks. Since these products are of vital importance to home security, we make sure that our stock is only made up of designs manufactured by reputable brands. A notable concept is the Abus patented model which comes fully equipped with a hardened steel body and high impact plastic cover. There are similar products available within our sold secure range. Our definitive range of exterior hardware and security designs continues with our ironmongery security products. A lime share of our selection is made up from the Bulldog shutter door lock system which has the ability to secure metal, wooden or glass fibre garage doors. These are British-made designs that have the option of being used inside or outside and come with a 5-year guarantee. Finally, we have a wireless monitoring set which can be located within our surveillance kits page. This is one of the most inventive designs of its kind on the market today having been manufactured by industry leaders Abus. This is a fully complete set that comes with a recording device, two wireless outdoor cameras and three power supply units.